London is a place dizzying in its busyness and contemplative in its history. As with other cosmopolitan cities, the world meets here. People from all points on the compass live, work, and visit here. 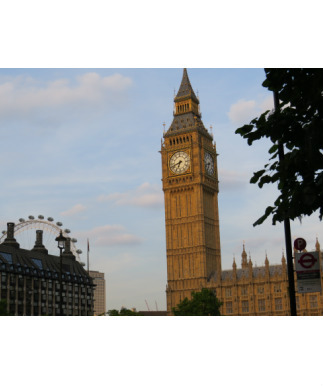 Thus, a visit to London is an encounter with the world. I arrived in London on one of the few rainy days we have experienced. Deborah and Catherine had traveled here on Friday, so Deborah was already settled into our bed and breakfast. As I mentioned in the last entry, we are staying in the home of Sue and Roger Davis. Roger is an architect and designed the house in an Asian style constructed primarily of teak and glass. It is a lovely home and Sue and Roger are wonderful hosts. 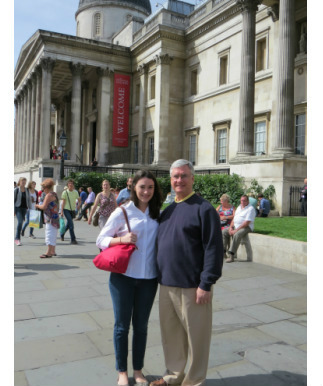 Our first venture into London was a visit to the British Museum. 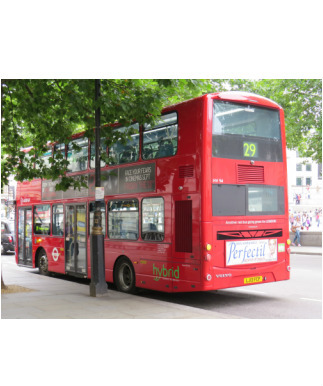 Catherine was busy with her students, so we were on our own to negotiate the London transit system and did quite well. The museum itself is a gorgeous building and holds treasures from all over the world, many acquired during British conquests of their empire. We strolled among Egyptian mummies, viewed jewelry and household items from Mesopotamia, and were dwarfed by ancient statues from Egypt, Assyria, and even Easter Island. A special exhibit of coins related to the Bible was of interest, and we also enjoyed seeing the displays from Asia and Africa. On Monday Catherine led us on our first venture on “the Tube,” London’s subway system. 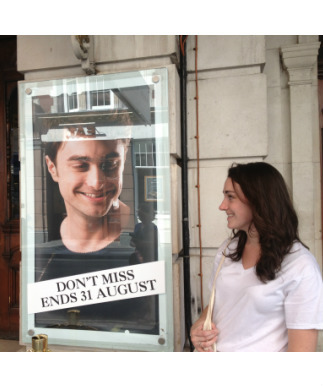 The highlight of the day was seeing The Cripple of Inishmaan starring Daniel Radcliffe of Harry Potter fame. It is a funny and moving story of a young crippled man who longs to escape the banality of his life on an island off Ireland by becoming a movie star. The play also prompts the viewer to carefully look and listen for the truth which is not always obvious. Deborah and I were on our own again on Tuesday, so we decided to visit the Tower of London, the first palace in London built by William the Conqueror who won the Battle of Hastings in 1066 (one of the few dates I remember from high school history classes). 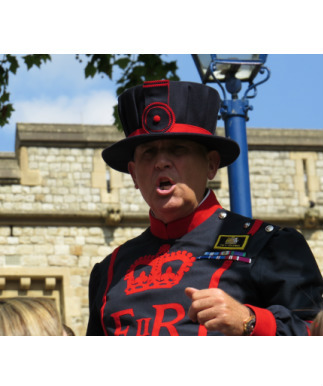 We enjoyed a delightful tour by one of the “Beefeaters,” the Yeoman Warders who have guarded the palace since the fifteenth century. 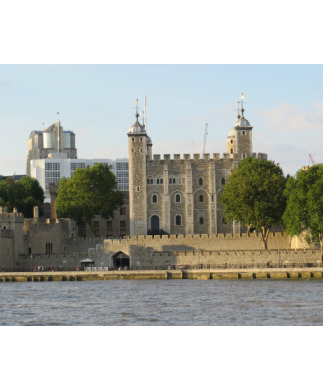 We heard the sordid history of murders and beheadings for which the Tower is known as well as viewed the vast display of medieval armaments and the fabulous Crown Jewels. One pleasant discovery in this beautiful building was the 11th-century Chapel of St John the Evangelist, one of the oldest examples of a Romanesque chapel that exists. We crossed the Thames on the picturesque Tower Bridge and enjoyed a quiet dinner in one of the many cafes on the south side of the river. The day was closed with another walk across London Bridge, which is not very picturesque at all. We were reminded later that the original London Bridge can be found in the Arizona desert. We met Catherine early on Wednesday morning in Leicester Square and proceeded to Trafalgar Square where there is always plenty of activity. In recent years, an empty plinth has been the home of temporary statues, some controversial. At this time, there is a huge blue cockerel guarding the square below the tall monument to Admiral Lord Nelson. Making our way down Whitehall Street, we came upon the famed Horse Guards who keep vigil at the entrance to what could be considered the “front yard” of Buckingham Palace. These young men in their red uniforms and mounted on black horses are featured in pictures with people from all over the world, yet they never change expression. 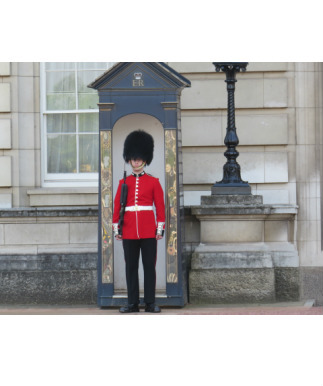 We were able to see the changing of this guard on the parade grounds just inside the entrance. We walked further along the street and came to No. 10 Downing Street where the Prime Minister lives. It was obvious that something was up as news teams were gathered within and outside the gates. We later learned that reporters were hoping to learn something of the British response to the crisis in Syria. 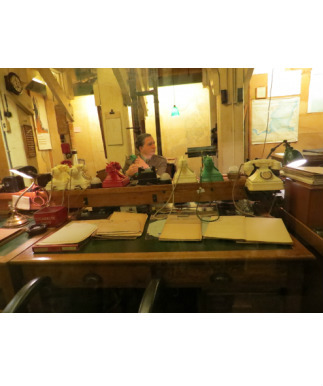 A block further on, we came to the Churchill War Rooms where Prime Minister Winston Churchill and his faithful staff conducted the British World War II campaign for six years. The rooms have been reassembled as they were the day the lights were turned off after the war was over. 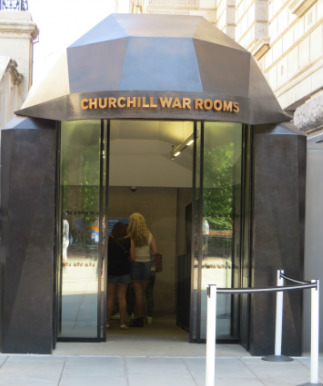 It is a moving memorial to the ways in which the British government operated during those years and the toll that war took on London, Britain, and the world. It was nice to emerge from the dim war bunker into the sunshine of a lovely British afternoon. We strolled through St. James Park to Buckingham Palace. Since the Queen was not at home to receive us, we were satisfied to take pictures from outside and walk back down the mall to see where Prince Charles and the Duchess of Cornwall, along with Prince Harry, live when in London (Clarence House). 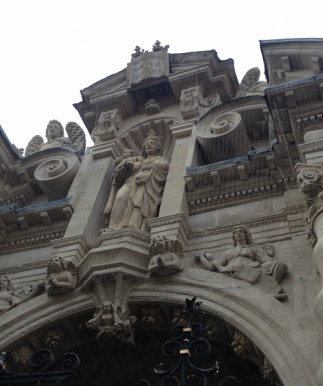 We also saw monuments to King George IV and the Queen Mother. We made our way back toward Parliament and enjoyed a delicious dinner at St. Stephens Tavern across the street from “Big Ben.” We enjoyed hearing the hour chimed later that evening. Catherine had to return to Worrell House, so Deborah and I made our way to Evening Prayer at Westminster. 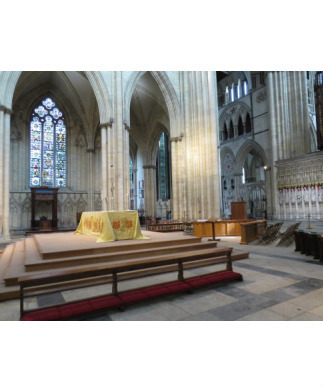 We were awed to be in this house of worship which for centuries has witnessed the coronations, marriages, and funerals of kings and queens as well as the plaintive prayers of people like us. On our journey back to our guest house, we passed No. 10 Downing Street again. 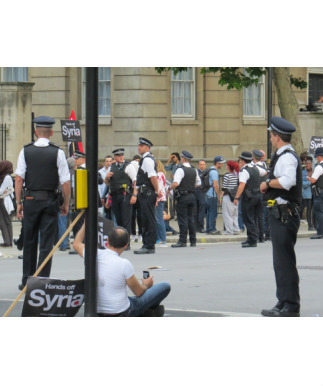 This time the street was thick with protesters against military action in Syria. 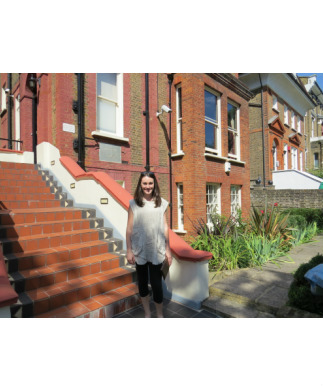 We visited Worrell House on Thursday and had a chance to meet some of the students and see where Catherine lives while in London. We dined at Oliver’s, one of her favorite places for fish and chips. We were not disappointed! Catherine then took us on a stroll through her neighborhood. We walked up Haverstock Hill toward Hampstead Heath, the highest point in London. It was a lovely stroll through several villages along the way. A little later we made our way back to Covent Square to see the acclaimed play, War Horse. War Horse tells the story of a young man and the colt he raised which was sold by his father to be an officer’s horse in the First World War. It is a heart-wrenching tale about the horrors of war and how it affects all of life. The story of the million or so horses who died in the war remind us of the vast reach of violence and the ways in which relationships with all of God’s creatures can bring healing and hope. Our wanderings were made all the more adventurous on Friday when we realized that a portion of the Tube was out of service. Catherine managed to get us on the right bus and then onto other tube lines that eventually took us to the Kensington area. Our first stop was the Natural Science Museum where we saw lots of dinosaur remains as well as a compelling black and white photo exhibit called “Genesis.” The artist visited some of the remaining unspoiled places on earth to remind us of our roots and the mutually beneficial relationship between humans and nature. 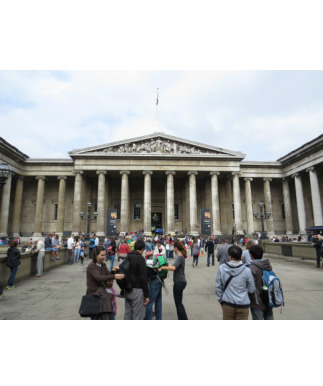 Next, we headed to the Victoria and Albert Museum where we enjoyed seeing the “Raphael Cartoons,” which are full-scale designs Raphael created for tapestries that would eventually adorn the lower walls of the Sistine Chapel. Catherine and Deborah also visited a gallery featuring Asian design and another exhibit highlighting fashion. After lunch in the museum café, we made our way to Kensington Palace, the London home of The Duke and Duchess of Cambridge and their newborn son, George. 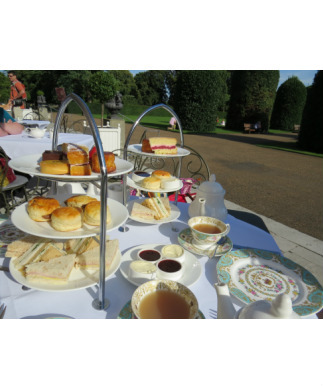 Again, the Royals were not at home, so we enjoyed high tea at the Orangery, a café located on the grounds of the palace. Catherine had to hurry back to her duties at Worrell House, so Deborah and I took the Tube to Covent Gardens and browsed some of the shops and sights there before returning to our room in Camden Town. 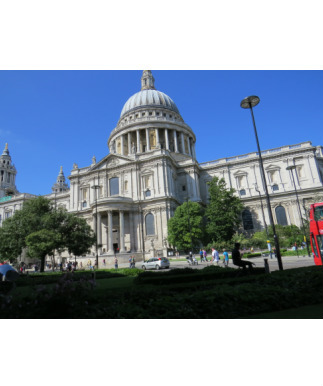 Our goal for Saturday was to tour St. Paul’s Cathedral and make our way across the Thames sightseeing. We arrived at the cathedral early and enjoyed a quick breakfast at a nice French café in its shadow. By the time we entered the cathedral itself, a Eucharist service was beginning, so we stayed and worshiped in St. Paul’s. It was a simple and beautiful service. Following the service, we were able to walk around a bit and take in the beauty of the sanctuary. We discovered an exhibit called “Caravan: In Peace and With Compassion.” There were twenty-five life-size donkeys that had been decorated by Egyptian and Western artists to convey their notions of peace. It is a creative way to generate conversation about our views of peace. Leaving St. Paul’s, we followed the map to Peter’s Hill where a memorial recalls the sacrifice of firefighters who gave their lives saving London during the blitz of World War II. The memorial also honors other firefighters who lost their lives in peacetime service. We walked across the Thames on the Millennium Bridge which brought us to Shakespeare’s famous Globe Theater. We walked a few blocks further and found an exhibit of the foundation of The Rose Theater which predates the Globe and at which Shakespeare himself debuted some of his plays. Across the street is an area which holds the ruins of the original Globe. It is quite an historic section of town. 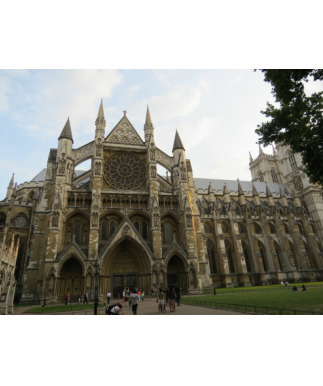 A few blocks away we found ourselves at Southwark Cathedral, a stunning building which nearly met its demise when the neighborhood declined decades ago. It is now a vibrant congregation with a broad ministry in the area. We were fortunate to be able to participate in their evensong service and to hear a visiting choir sing. Afterward we walked through the nearby Borough Market which offers food from around the world. 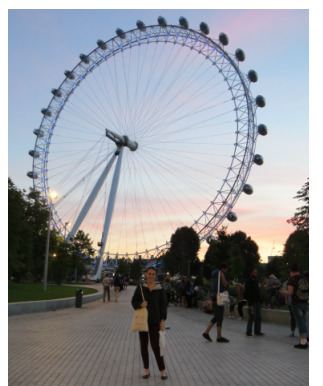 We enjoyed Spanish cuisine at a little café underneath London Bridge and then took the Tube back across the river to the London Eye. The London Eye was built to celebrate the new millennium at the beginning of 2000. It is a cantilevered wheel that moves 36 large capsules high over the skyline of London to provide stunning views of the city. 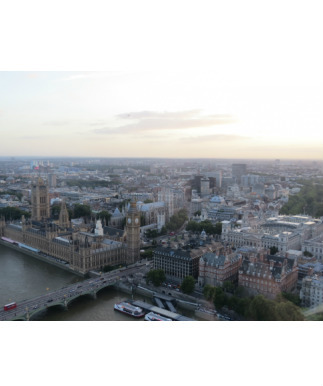 The clear day and approaching sunset made for beautiful scenes of London. It was a perfect way to end a good day and a terrific week in the city. Sunday offered an opportunity to visit the National Gallery in Trafalgar Square where we saw paintings by some of the great masters. We enjoyed lunch in the Crypt Café at St. Martin-in-the-Field and were able to view a couple of their art galleries, one of which displayed the creations of homeless people who come to St. Martin for assistance. We walked the few blocks down to Westminster Cathedral for a brief visit before locating our bus for the ride back to Camden Town. The rest of the evening was spent repacking suitcases and preparing for our trip home. Early on Monday morning, we said our goodbyes to our hosts and headed for the airport. Catherine went with us which allowed for a little more time before we had to say goodbye to her. Although the plane was delayed almost an hour, the pilot managed to make up for lost time and arrived at the gate in Raleigh about ten minutes ahead of schedule. Our flight was uneventful, which is always good for travel. We returned home, tired but energized by all that we had done and seen, deeply grateful for the time we shared with our children, and thankful for a church family that allowed us to enjoy such a wonderful experience. We are now home and happy to be here. We are also eager to see you again when we meet for worship on Sunday. Although warned that it rains often in England, we have been fortunate to enjoy relatively mild and dry weather. While it did shower off and on this last week at Oxford, it was overall a beautiful and pleasant week. A new week of classes began Monday morning. I had chosen to take a class on The Psalms with Dom Henry Wansbrough, a Benedictine monk renowned for his biblical scholarship. Dom Henry has served on the Pontifical Biblical Commission and was the General Editor for the New Jerusalem Bible, an excellent translation of scripture. Thinking that this course on The Psalms might provide me with a new perspective for personal devotion, I was surprised when Dom Henry proceeded to demonstrate the ways in which the Psalms tell the history of Israel and figure prominently in the revelation of Jesus as Messiah. While these perspectives were not new to me, the depth to which our tutor went to illustrate the vitality of the Psalms was exhilarating. It was a challenging and fruitful class, one to which I looked forward each day. The afternoon class was an exploration of the relationship between religion and science in matters of ethics. Because we deal with matters like ecology, climate change, scientific research, and biomedical ethics on a regular basis, I knew this course would be a good refresher for me. 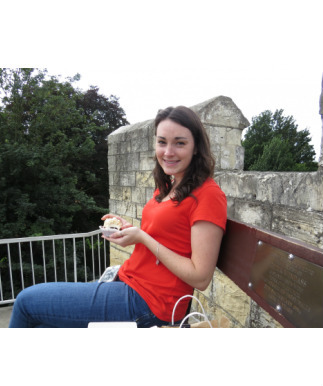 The tutor was a young scholar from Virginia who was educated at Duke University and now calls Oxford home. He helped us to better understand the historical relationship between religion and science and the current state of the relationship. As we looked at particular issues such as care of the environment, our relationship with other animals, and our perspectives on end of life issues, it became clear that science and religion need each other to benefit and prosper all things living. 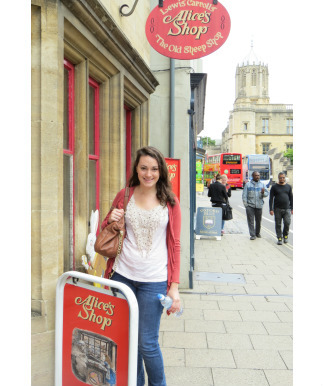 The week also provided opportunities to explore Oxford. One of the tutors and Chaplain for the week, the Reverend Canon Dr. Robin Gibbons, led a group of us on a tour of Christ Church and Oxford itself. We discovered remnants of the medieval monastery that preceded Christ Church and the elaborate adornments applied to walls and ceilings which witnessed the faith of the earliest inhabitants of the buildings. 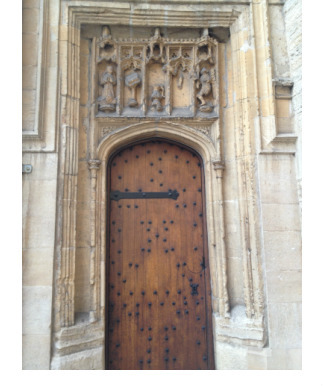 Walking through the streets of Oxford, we were able to see “Narnia,” inspiration for C. S. Lewis’ wonderful stories. 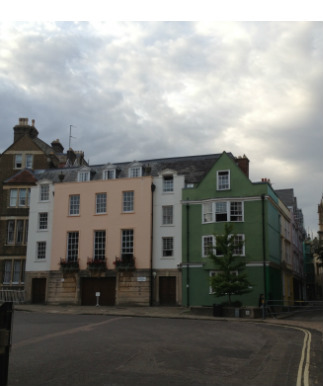 This section just outside the gates of Christ Church is comprised of a series of pastel painted buildings. The doors on either side of the back of the section, however, open onto two ancient Roman roads which still run through the buildings. Thus, the doors open onto “another world.” The Cathedral Church of St. Mary the Virgin features the oldest sculpture of Mary, a work of art that was once fired on during the Reformation struggles. Peering into the gates of All Souls College, we could see the Hawksmoor Towers which, in the bright noonday sun, appear to be “ivory towers” in which scholars are often thought to live. We also visited the spot where the “Three Martyrs” (Thomas Cranmer, the Archbishop of Canterbury; Nicholas Ridley, the Archbishop of London; and Hugh Latimer, the Bishop of Worcester) were burned at the stake in 1555 for “Protestant heresy.” Fortunately relationships between Catholics and Protestants have greatly improved over the past 600 or so years. Clearly, to live and study in a city whose history dates back over a thousand years is an experience of continual discovery and awe. Our week ended with a moving experience of worship provided by students and the traditional closing banquet held in the Great Hall. It was a wonderful meal and good fellowship before we all went our separate ways on Saturday. It has been a privilege to make new friends from throughout the world and to exchange ideas about matters of faith and practice which have benefitted us all. 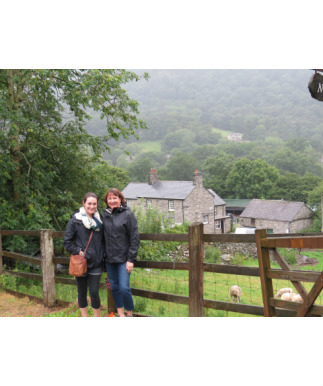 While I was “toiling away” in Oxford, Deborah and Catherine were exploring other parts of Great Britain. After their stay in Wales, they boarded the train for Edinburgh, Scotland. 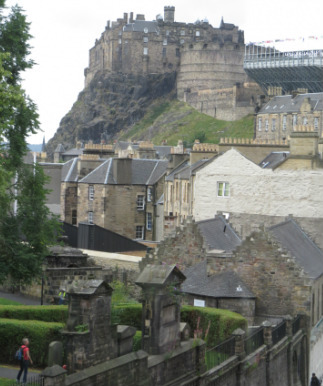 While there, they enjoyed being in the midst of the annual Edinburgh Arts Festival. 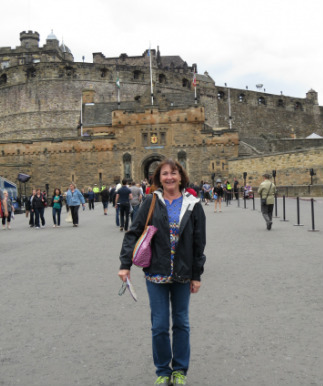 They visited the National Gallery of Scotland and explored the “Royal Mile” with Edinburgh Castle at one end , St. Giles Cathedral in the middle, and shops and galleries all along. 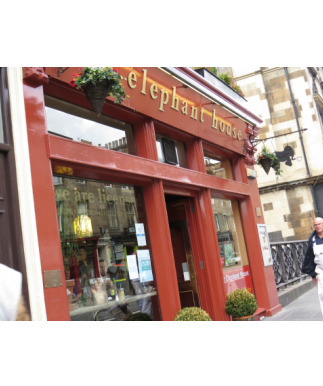 Deborah and Catherine enjoyed lunch at The Elephant House, a tavern where J.K. Rowling is said to have written her Harry Potter books, and visited the nearby cemetery where she supposedly gleaned names for some of her characters. They also spent time at the castle which surely provided some inspiration for Hogwarts School. Late Wednesday afternoon Catherine and Deborah headed for York by rail. The first settlement here was in the late first century. The Roman city provided the foundation for the medieval city which remains to this day. 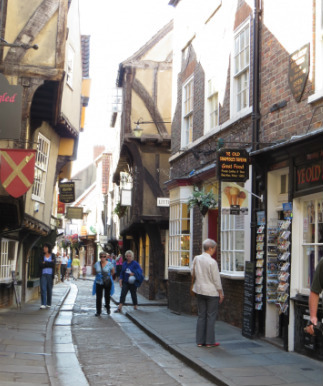 They walked along the winding cobbled streets, visited the “Shambles,” timbered houses that now serve as shops, and admired the many handmade goods of local artisans. A unique experience was exploring Jorvik Viking Center, built on the site of the original Viking settlement. This recreation of a Viking city offers tourists an opportunity to see how these early settlers lived. 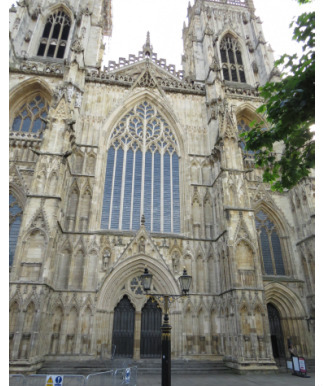 Another memorable opportunity was walking the city walls and visiting York Minster, England’s largest medieval church, begun in 1220. It holds the largest collection of medieval stained glass in Britain. 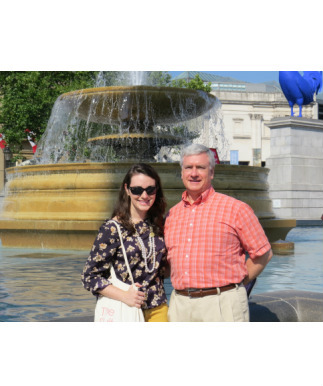 By Saturday afternoon, we had all traveled to London where Catherine will remain as the Resident Assistant at the Wake Forest Worrell House. Deborah and I are staying as guests in the home of Sue and Roger Davis, who offer a unique bed and breakfast experience. Along with their 28 year-old parrot named Peckham, they offered to help us navigate the city and experience the best that London has to offer. One more adventure begins! Oxford at last! 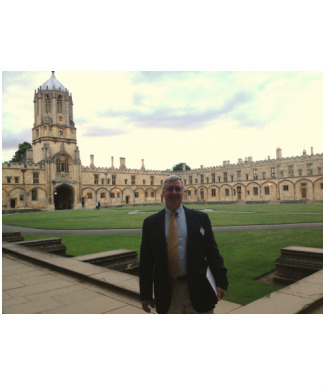 Studying at one of the schools at Oxford University has been a dream of mine since my seminary days when my pastor at the time made a similar journey. It took nearly thirty years to make it here, but it was worth the wait! Once again, I am deeply grateful for this opportunity. My last entry ended following our harrowing experience at Heathrow Airport and our early morning trip to Oxford. Following a few hours of sleep, I made my way up Abingdon Road/St. Aldates to Christ Church College. Along the way, I found myself crossing Folly Bridge over the River Thames. 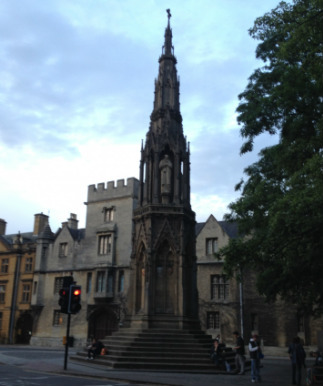 I had not realized that it flowed through Oxford before making its way to London. Oxford folks will claim that a lot of good things come through Oxford first before making their way to London. It is a city with a lot of pride. Following a brief orientation and reception, we students and tutors made our way to The Hall for dinner. To my surprise, The Hall is where Christ Church students and teachers have dined for centuries. 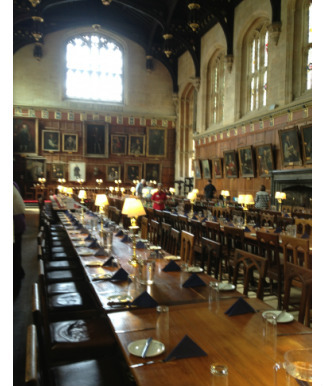 It is also the dining room which was featured in the Harry Potter movies as the dining hall at Hogwarts! It is an impressive place with long rows of tables, the portraits of former students and teachers adorning the walls, and very delicious food. Christ Church was also the setting which inspired Charles Dodgson (a.k.a. Lewis Carroll) to write Alice’s Adventures in Wonderland. 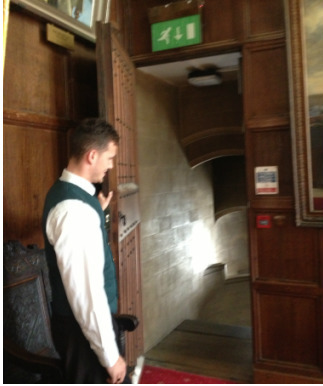 In the corner of the dining hall is a small door leading to a spiral staircase which might be used for a quick exit by the Dean of the school following dinner. It was commonly known as “the rabbit hole.” Other elements which appear in the book can be found at Christ Church and nearby in the community. 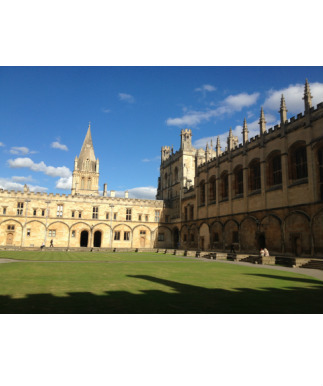 Christ Church, and Oxford as a whole, is quite impressive. 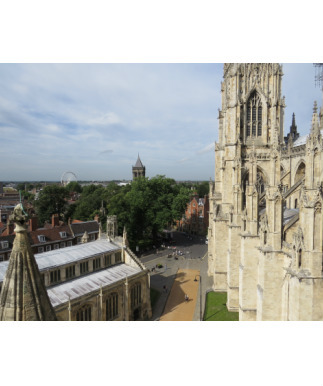 The school was founded in 1524 as a Cardinal’s college and was re-chartered by King Henry VIII in 1546 as an attempt to unite faith and learning. 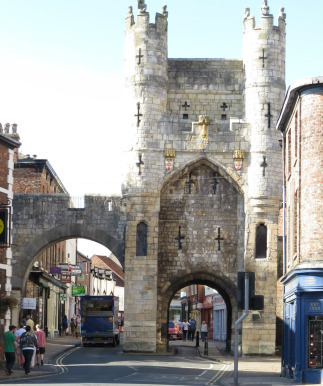 To walk through Tom Gate (the main entrance) is to step back in time nearly five hundred years as you enter what looks like a medieval fortress. 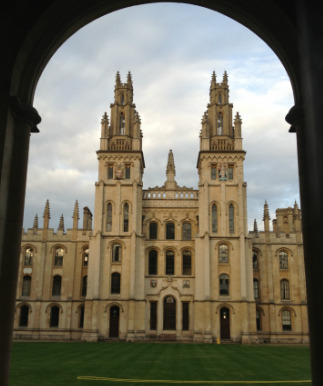 The college’s bell (Old Tom) still rings 101 times promptly at 9:05 p.m. every evening (Oxford time). This tradition remembers the 101 original students who were given just enough time to get inside the gate each night before they were locked shut. The Theology Summer School offers two classes each week. I chose “Christian Freedom through the Eye of Milton” and “Using the New Testament in Ethical Dilemmas Today” for the first week. Each class meets for three hours each day (morning or afternoon) with a thirty minute break during each class for tea. It is England, after all. In the Milton class, we read Paradise Lost, Paradise Regained, and Samson Agonistes, three great poems by John Milton which helped us look at the issue of free will and God’s role both in Creation and The Fall. 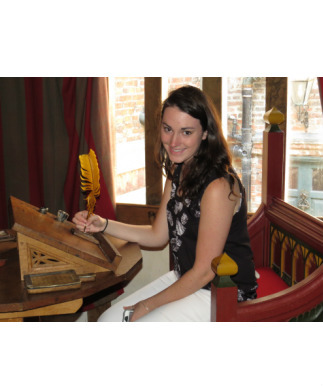 Our tutor, Erica Longfellow, made Milton’s 17th Century writings accessible and meaningful. I gained a new appreciation for these biblical stories and how their interpretation can reflect personal and political realities. In the afternoons, Professor Richard Burridge led us through his method of looking at ethical dilemmas by considering the relevant words and actions of Jesus as well as other New Testament teachings. It was a most helpful approach to relating scripture to twenty-first century ethical issues that are not directly addressed in biblical writings. 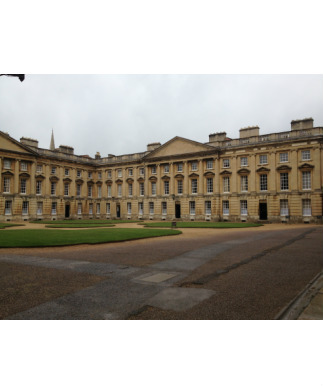 Deborah and Catherine spent their time walking around Oxford, exploring shops, museums, schools, and enjoying a proper English tea. 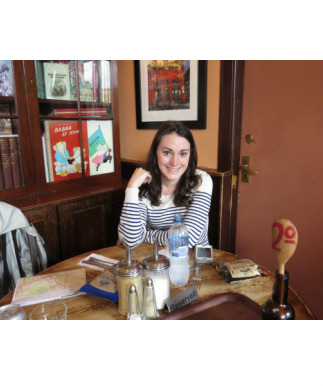 We enjoyed trying a variety of restaurants and pubs where the locals dine. 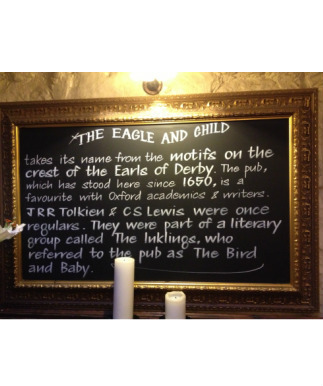 A highlight of the week was enjoying a meal of fish and chips at The Eagle and Child, the 350+ year old pub where C.S. Lewis, J.R.R. Tolkien, and other writers known as “The Inklings” were regulars. 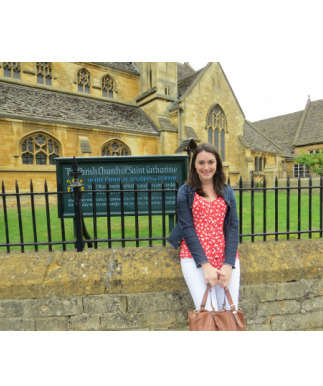 On Wednesday, Catherine and Deborah enjoyed a tour of the Cotswolds, an area of charming villages in the rolling hills of England. Early Saturday morning, we packed our suitcases once again, rented a car, and headed for North Wales. It was my first (and maybe only!) experience of driving on the “wrong” side of the road, but we made it safely to the village of Betws-y-Coed at the foot of Mount Snowden. On the way we enjoyed seeing the beautiful countryside with its miles of drystone fences where cattle and sheep grazed. As promised by a friend, it rained in Wales, but the sun came out and our enjoyment was not at all diminished. 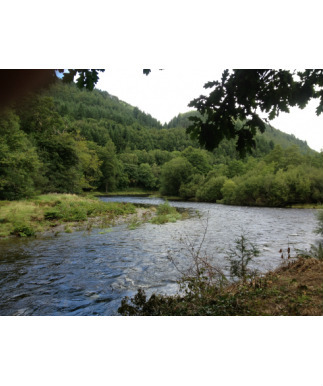 Our bed and breakfast was located just outside the village across a small river. 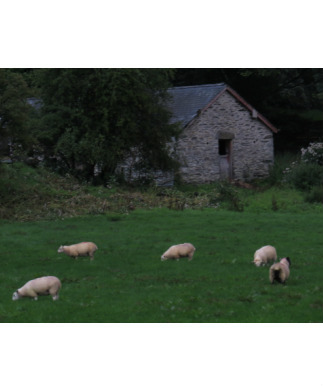 Our host told us that we could easily walk to the village by first crossing the road, walking down a farm road, then taking the path through a sheep pasture to the river. Indeed we did walk close by the sheep (though they were fenced in) and heard their bleats of curiosity as we passed by. 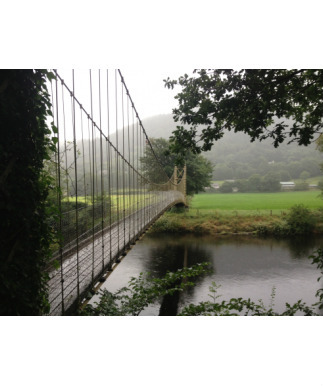 To get to the other side of the river, we walked over a suspension bridge built in 1930. 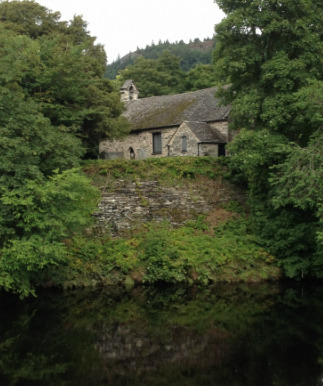 Just on the other side of the river sits a little stone church–St. Michael’s–that was originally built in the thirteenth century. It was enlarged in the eighteenth century, but the look and character of the building remain as they have been for hundreds of years. Identified graves in the cemetery date back to the 1600's and the font in the church was sculpted in the thirteenth century, actually pre-dating the sanctuary. The village itself is charming and offers lots of shops and places to eat. 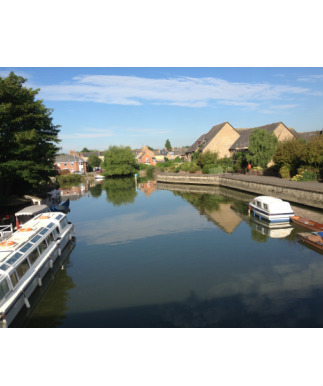 On Sunday we were able to take a leisurely stroll along the river as it curled back around the town. It was a peaceful walk and most of the time we heard nothing but the call of birds and the sound of the dancing waters. Wanting very much to stay and enjoy Wales, I had to leave and return to Oxford in time for orientation for the second week of classes. Deborah and Catherine remained and planned to board a train on Monday for a trip to Edinburgh and York. 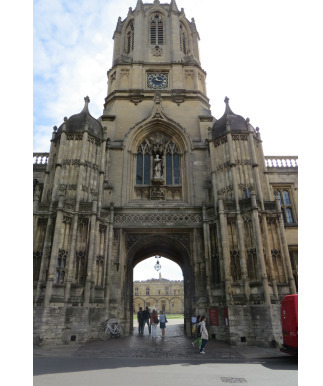 Constantly reminding myself to “keep to the left,” I returned safely to Oxford, returned the car, and settled into one of the dorm rooms at Christ Church, eager to begin another exciting week of study. For the seasoned traveler, visiting several countries in a brief space of time might seem insignificant. For folks who do most of their traveling between a couple of states, however, touching the soil of five European countries in eight days is a bit overwhelming. Following our delightful sojourn in the Tatra Mountains of Slovakia, we boarded a train bound for Prague, Czech Republic, on Friday morning. 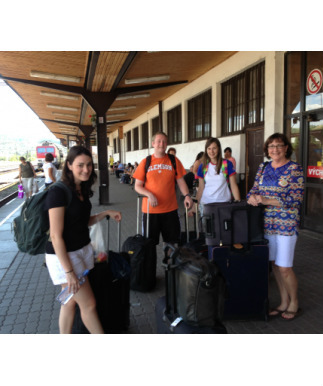 The following Monday, the rails took us to Vienna, Austria, and on Thursday, we train hopped to Budapest, Hungary. Saturday morning found us boarding a plane for the UK. 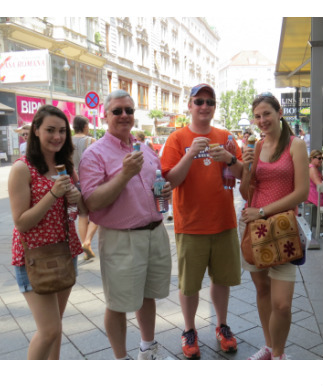 It was a busy week, but one filled with the sights, sounds, and tastes of Central Europe. 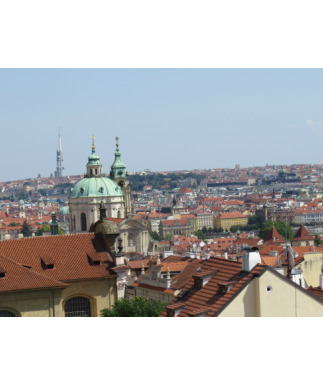 Deborah had found an apartment in a back street section of Prague which exceeded our expectations. Our apartment had a terrace which looked out over the red-tiled rooftops of the city. Although we were too tired to spend much time there on Friday evening, the five of us spent several hours on Saturday evening talking, enjoying the sunset, and watching a storm move in from the east. As darkness turned on the lights of Prague, someone treated us to a fireworks display that completed a full and wonderful day. That morning began with breakfast in The Bake Shop, a great café that became our first stop every morning for breakfast. 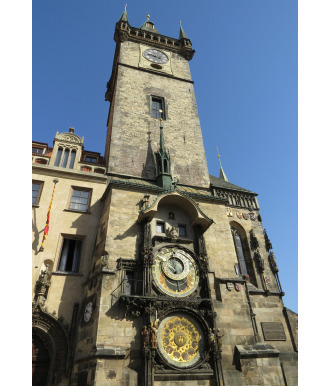 We walked to the nearby Old Town Square which includes St. Nicholas Church, the double-spired Tyn Church, and the famed Astrological Clock. We joined the throngs at the clock and watched as a skeleton pulled the chain that initiated the chimes and the appearance of the Twelve Apostles moving past two little windows. The show was concluded with a live trumpet blast from high in the tower. 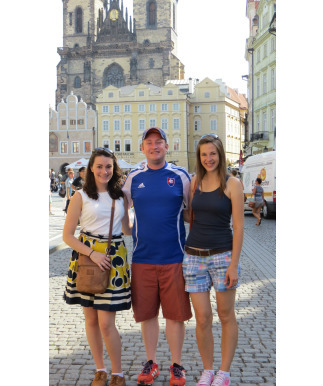 We soon trekked across the Charles Bridge and enjoyed seeing the artists and other vendors along the road. Several musicians were performing as well. I don’t think you have quite lived until you hear a Czech trio play “Folsom Prison Blues” on a guitar, horn, and washboard with the lead singer pining away through a horn-like instrument. Johnny Cash would be pleased. Our tour of the Vitus Cathedral inside the palace complex was inspiring. 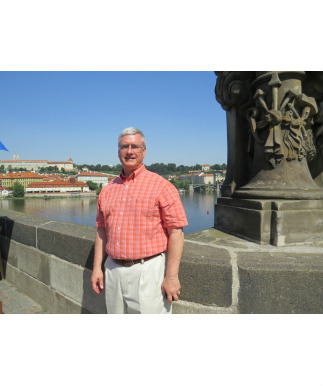 The Palace offered a great view of Prague’s history, but we all enjoyed seeing Golden Street with its tiny sixteenth century houses tucked into the outer walls of the palace. 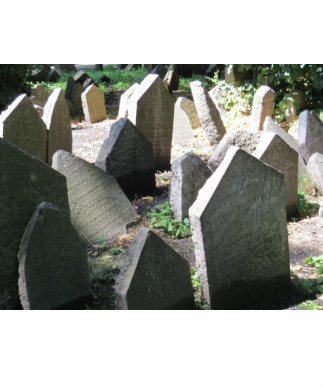 On Sunday, we spent much of the morning in the Jewish Quarter, visiting synagogues, museums, and the old cemetery. Once again we were confronted with the horrendous treatment of the Jews before, during, and after World War II. Deborah was particularly interested in an exhibit of artwork created by children in the Terrazin Internment Camp. In order to help the children cope with their terrifying situation, a teacher in the camp taught them how to use art to express what they remembered, experienced, and hoped for as a result of the war. This teacher was eventually sent off to one of the death camps, but she left behind over 4000 pieces of the children’s artwork. We missed out on worshiping in one of the churches since many of them did not hold services until late in the evening. The Jewish Quarter experience, however, was a time of prayerful reflection on the value of life and the creative human spirit. 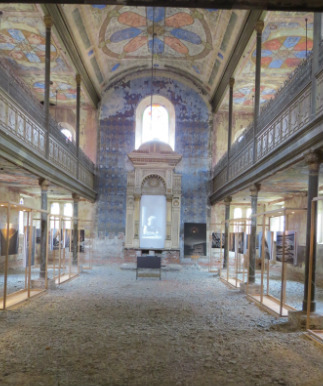 In the evening, Deborah and I attended a concert in the Mirror Chapel (1724) located in the Klementinum complex of buildings which was founded in 1232. 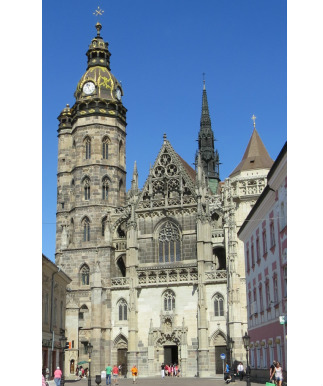 Featuring a string quartet supported by pipe organ, the program included works by Mozart, Bach, Handel, Pachelbel, Schubert, Smetana, Dvorák, and Vivaldi, whose “Four Seasons” is a staple in the city. Midday on Monday we boarded the train for Vienna. We were quite a group with so much luggage to hustle on and off the trains. 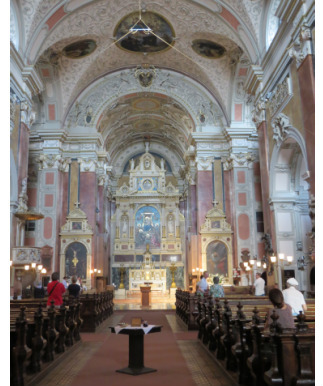 We arrived on the outskirts of town, took the subway into the Old City, and walked a few blocks to Benediktushaus, a guest house attached to the Benedictine Schotten Abbey (although named the “Scotts Church,” it was actually established by Irish monks). Our unique guest house was in the heart of Vienna, and we were awakened each morning at 7:00 by the tolling of the church bells. Breakfast was provided and, fortunately, so was a fan. Temperatures soared into the high 90's this week and made comfortable sleeping a challenge. 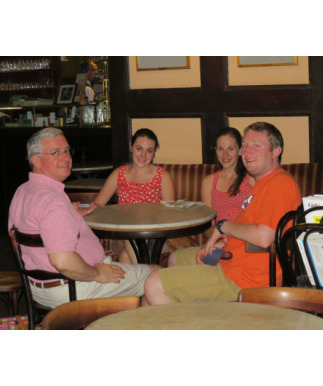 We dined at an outdoor café our first evening and enjoyed delicious Viennese fare. A good night’s rest prepared us for an early exploration of the city. We chose to begin with a “Hop On and Hop Off” bus so that we could see as much as possible and stop when we wanted. 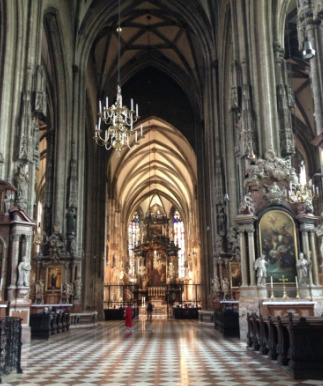 We were awed by the beauty and size of St. Stephan’s Cathedral and were fortunate enough to be present as Mass began and one of the pipe organs played. Lunch was at the famed Figmüller Restaurant which boasts the largest schnitzel in Vienna. One schnitzel is larger than the plate on which it is served and five of us dined heartily on two of them. Gelatti in one of the plazas topped off the meal in a fine way. One of Mozart’s homes (he lived in a couple of dozen different apartments in Vienna) was our afternoon adventure. To stand in a room where one of the greatest composers lived, wrote, and played was an awe-inspiring experience. To learn more of Mozart’s history was a nice treat. The remainder of the afternoon was spent visiting the Imperial parks, general sightseeing, and shopping. I had an opportunity late in the afternoon to sit in on part of the evening vespers in the Schottenkirke. The entire service was chanted and the acoustics in the old cathedral were ethereal. Wednesday found us dividing in order to conquer so much culture. 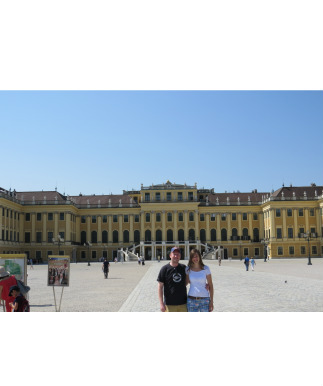 Catherine and Deborah chose to tour the State Opera House and museums in Vienna, while also visiting a few chocolate shops. 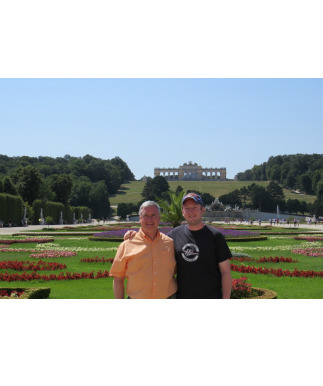 Robert, Lenka, and I ventured out to Schonbrunn Palace, the summer home of the Hapsburg rulers. The rooms (of which there are over 1000) are gorgeous and interesting. The gardens are magnificent. The history of the place and its inhabitants is at the same time dramatic and sad. The men and women who ruled their empire provided strategic leadership in many ways but brought dire oppression in others. Family, while important, took on more of a political value as daughters were married to form advantageous alliances and sons were sent to foreign soil to broaden the scope of the empire. On the way back into Vienna, we stopped at the Military Museum which provided Robert and me a much-needed lesson in the history of Austria. The artifacts were interesting to see, but the fact that very little of the history of Europe has enjoyed peace was sobering. We rose early Thursday morning to pile our luggage into a taxi-van and find the main train station which is still under construction. We changed trains in Bratislava, Slovakia, enjoyed our last meal together, and said a said a sad goodbye to Robert and Lenka. 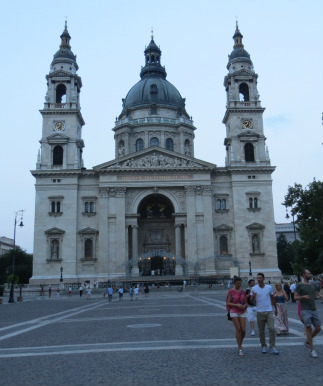 They had to return to Koice for work and we headed on to Budapest for a day of sightseeing and the flight to London. 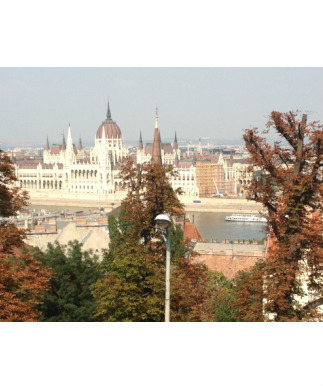 By the time we arrived in Budapest, the temperature was at least 100 degrees and we were exhausted with travel. After refreshing ourselves, we ventured to a nearby restaurant suggested by our host. The food was wonderful! It was so good we planned to return the following evening, which we did. The next morning we hopped on and off another bus around Budapest in order to see as much of the city as we could in one day. 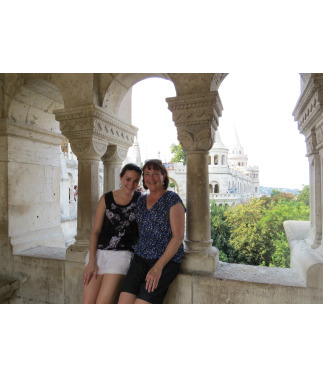 We spent most of our time on the Buda side around the castle area and the Fishermen’s Bastion. We walked across the Danube on the Chain Bridge and eventually traversed an active downtown plaza on Friday evening on the Pest side to reach a very moving exhibit along the waterfront near the Parliament Building. Along the sidewalk at the edge of the Danube River, two artists paid homage to the untold number of Jews who were lined up along the river, made to disrobe and shot in the back, causing them to fall into the river so that it might whisk their bodies away. Sixty pairs of rusting metal shoes remind us that Jews of all walks of life–young, old, middle-aged, wealthy, poor, working class, mothers, fathers, children, businessmen, housewives, shopkeepers, farmers–were the victims of genocidal hatred during the Second World War. 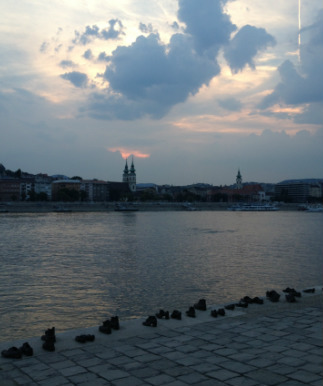 We took time to look at each pair and sat in silence as the sun set over the Buda side of the Danube. On the way back to our apartment, we noticed that St. Stephen’s Basillica was just ahead of us. Hoping to be able to look inside, we discovered that a two-organ concert was about to begin. We hurriedly purchased tickets and headed inside. The Basillica itself is a work of art, but the music of the two pipe organs surpassed even the beauty of the building. The program included many of the pieces to which Mark treats us Sunday by Sunday. It also featured a trumpeter and a soloist who offered three different versions of “Ave Maria.” It was a divine experience which was much needed considering the very trying experience that lay ahead. We rose early on Saturday, repacked suitcases, and headed to the airport. The flight to London via Frankfurt went well and offered an opportunity to complete my reading of John Milton’s poems Paradise Lost and Paradise Regained, which will be discussed in one of the classes in Oxford. All was fine until we went through the UK Border Security. Deborah and I were allowed to enter with no problems. 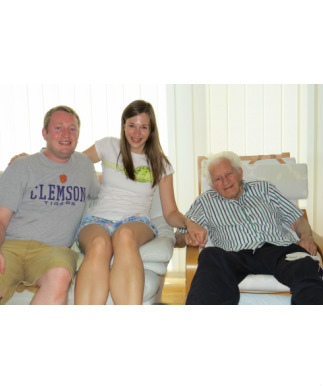 Catherine, unfortunately, did not have the proper documentation to explain her position as Resident Assistant with the Wake Forest study abroad program. What we thought would be a few minutes delay quickly turned into an agonizing eight hour struggle to get her approved for entry into England. Before we knew it, Catherine was escorted to another location, interviewed, and denied entry. We could not see her and could only talk by phone. The Border Police would talk with us by phone as well but soon informed us that Catherine would be sent home on a plane the following morning because she did not have the proper work visa. The problem was that Catherine did not know she was supposed to have this visa (which she was not, it turned out). Frantic to find a way to keep her here, we began to think of who we could call and turned to Jerry and Cassandra Baker, who are both Wake Forest grads, for help. Before long, emails and phone calls were moving globally to get help for Catherine. Within an hour or so, a letter from the Director of the Global Studies Program arrived in an email and I was able to forward it to Catherine. I called the Border Agent on the phone and talked at length with him about the contents of the letter, the specifics of Catherine’s work in London, and the category of visitor to the UK she fit. After putting me on hold for a very long time, the agent came back to the phone to say they had reviewed the rules again and determined that Catherine fit the category of Business Visitor and would be “landed” (allowed entry) within thirty minutes. We were overjoyed and so grateful to Jerry and Cassandra and all of the folks at Wake who pitched in to help resolve a potential disaster. Because it was almost 1:00 a.m. London time before Catherine was released, we decided it was too late to travel to Oxford. We sat in the terminal most of the night and caught an early bus for Oxford, arriving in the old city around 5:30 a.m. We found our way to our B&B, waited for the host to wake up, and promptly got a good sleep ourselves. We are now in Oxford, a beautiful city, with two week’s worth of study and exploration ahead for us. We hope much calmer adventures ensue! We have witnessed the artistry of creation in astounding ways. From far below the surface of the earth to high into the lowest reaches of the clouds, we have experienced the grandeur of God’s creative beauty. Following out medieval adventure on Sunday afternoon, we arrived in Demänová, a village outside the city of Liptoský Mikulá where Lenka’s father grew up. Lenka’s aunt runs a cottage here and allowed us to stay for the week. It was a wonderful place to rest with the sound of a mountain stream flowing outside and the views of mountains reaching far above us. Monday was a rest day, well deserved and welcomed by all. Our treat for the day was a visit with Lenka’s grandfather, her uncle, aunt, and cousins. For years the family was well known for its work in leather and furs and this city was renowned as a center for furriers. After grocery shopping, we drove to a ski area a few miles from the cottage and walked up to a beautiful little lake and hiked around it. It was formed ages ago when the glaciers receded from this area. Tuesday was an exciting day. 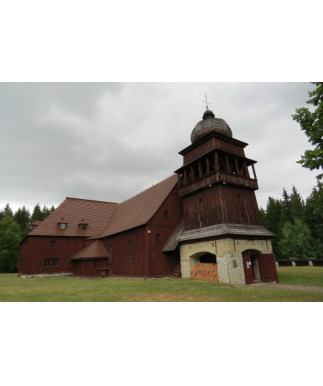 We began with a visit to the largest wooden church in Europe, seating 5000 people, now located in the village of Svaty Kriz (Holy Cross). The story of this beautiful Lutheran sanctuary is much more poignant, however. Originally built in a location now occupied by a man-made lake, the church was one of 39 allowed by the anti-Protestant Hapsburg Dynasty. Numerous restrictions accompanied the building of the church, but the faithful members persevered. Construction of the church began in 1744. It was built entirely of wood by a carpenter who could neither read nor write and had no plans to follow. It is an articulated building with a central altar, an ornate pulpit to the side, and two balcony areas. Painted scenes around the walls depict biblical stories and the smooth, worn wood bears witness to the believers who have worshiped in this building for nearly 250 years. Beginning in 1974, the church was relocated board by board and rebuilt on its present site. We traveled further into the Low Tatra mountains to the authentic Slovak village of Vlkolínec. The houses are constructed of logs in a particular style unique to that era several hundred years ago. The houses are whitewashed then painted either blue, green, yellow, or ochre. Some of the houses are still inhabited. We enjoyed walking around and visiting the few that were open. One of the features of the village is life-size log carvings of various characters. One of our favorites was of a violin player. We also found a life-size nativity scene appropriately located in a barn. Wednesday was another special day as Deborah and I and Robert and Lenka celebrated our anniversaries. 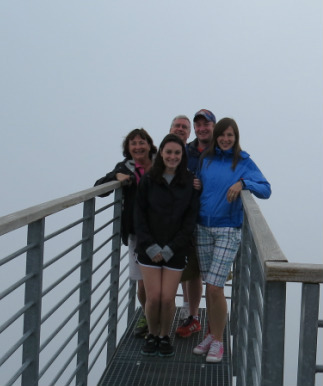 We left the cottage early to travel an hour to the High Tatra mountains so that we could take a ski lift to the top. 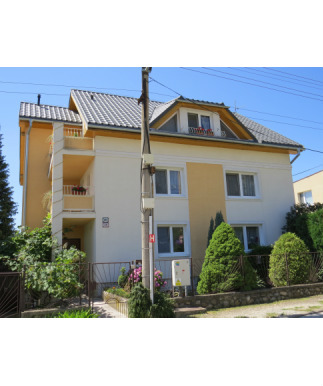 Because it is a popular tourist spot, we could not get reservations before 5:00 p.m. We enjoyed spending the day in the village of Lomnický Stit shopping, dining, and relaxing. Our turn to go up the mountain finally arrived. The journey required passage on two different lifts. 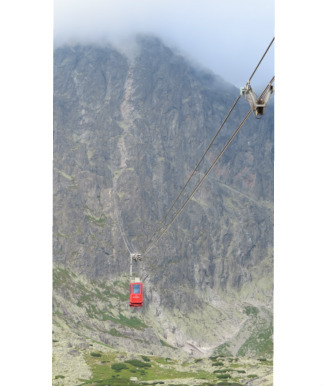 We joined about ten other people in the second lift and stood for our ten minute ascent up the mountain. It was a quiet ride with people speaking in hushed voices as we looked out on the vast landscape below and the looming mountain peak above. As we neared the top, the clouds increased. We got off and climbed numerous stairs to get into the little coffee shop at the top. We walked outside into blustery wind and clouds. 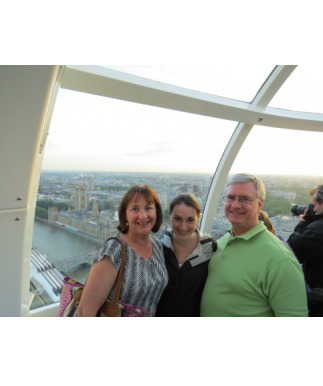 Robert and Lenka took us to the observation deck where they were engaged four years ago. We also went to another one that put us well out over the side of the mountain. Since the wind was rather strong, we witnessed the clouds rolling past us revealing clear skies and closing again like a curtain over the scene below. It was amazing to be so high and see such wonderful sights. In the midst of the rocky mountainside were beautiful yellow and white flowers growing out of the rock. What a wonder to witness such beauty high in the sky. On the way back, Lenka took us to another mountain lake where we found a nice restaurant and enjoyed a delicious meal of pizza. We set off for the cottage, but not before a solitary fox bid us farewell from the High Tatras. In contrast to the high reaching peaks of the mountains, we traveled down into the earth on Thursday. A thirty minute walk through the forest from the cottage, another of Slovakia’s natural wonders waits to be explored–the Demänovská Ice Cave. This particular cavern was first discovered and recorded over 350 years ago. We descended at least 145 feet into the cave where vast rooms and astounding formations greeted us. There is a wall where famous Slovaks signed their names upon exploring the cave decades ago. The bones of cave bears were found here and people three centuries ago thought they were the remains of dragons. One of the stalagmite formations is purported to be 350,000 years old, but the true wonders of the cave are the ice formations in the lower levels. Carved by a small river that flowed through the cave for millennia, water that pours into the cave in the winter months freezes forming ice ponds, columns, and slides that are beautiful. Even at the end of July, numerous ice columns reached high into the cavern to delight us all. Our sojourn in Slovakia is ending as we travel by train to Prague on Friday. We have enjoyed our time in this wonderful country, seeing where Robert and Lenka live and work, and spending time with Lenka’s family. About the time worship at Lakeside was ending on Sunday, I was standing in the chapel of Spi Castle, a medieval structure located northwest of Koice, just below the Tatra Mountains. 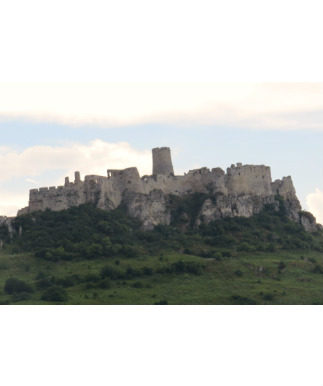 This castle was built on the foundation of a 5th century fortress and was utilized from the 12th-18th centuries. 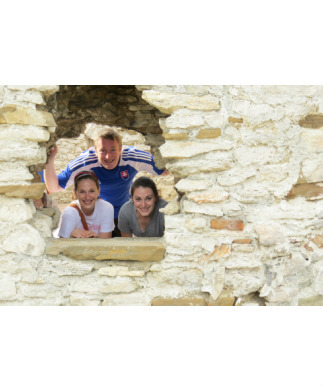 We enjoyed a delightful afternoon exploring the ruins and imagining life in that fortress high above a gorgeous valley. The day had begun early with worship. Robert and Lenka’s church is in the city, about a fifteen minute drive from the house. 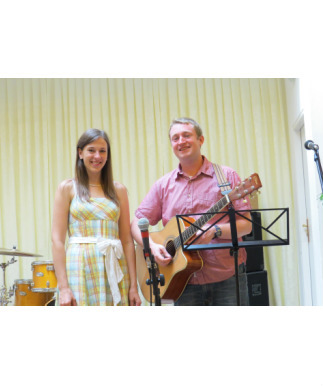 Robert and Lenka led worship which means that he welcomed everyone, prayed, and they led the music. Robert has become very accomplished on guitar and he and Lenka have nice singing voices. Their Second Pastor (Associate) had asked if I would offer the prayer topic which I was honored to do. The topic is essentially a devotional message that encourages the people to pray about specific things. I chose to talk about how Robert and Lenka’s relationship had brought our family into direct contact with the Slovak people and had even brought our two congregations into union. I encouraged us to be open to the small interactions that can begin fruitful relationships. After the topic, everyone stood and whoever wanted to pray did so. I ended the time with a prayer. Lenka translated for me and did a great job. 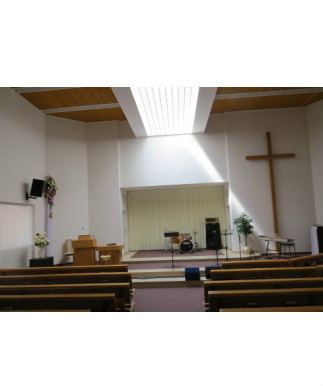 We were warmly greeted by the church members and were able to see the rest of the building which includes a beautiful café area that is often used before or after worship for gatherings. When we arrived back at the house, the Starons had prepared another feast: soup, squash filled with rice and meat, roasted pork roll, potatoes, cucumber salad, ice cream, cake, and coffee. 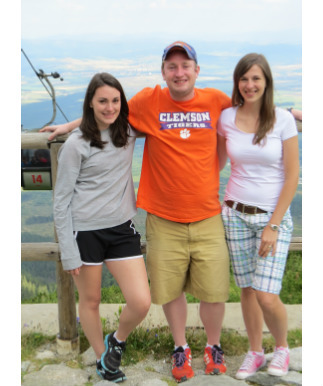 Following more pictures and grateful goodbyes, we headed for the castle and the Tatras. The days preceding were busy and fun. On Thursday, we enjoyed a garden breakfast of pastries and fruit. Daniel also offered smoked mackerel which was delicious. We drove into the city and visited the craftsmen’s street where a number of shops feature iron, pottery, leather, wood, and glass goods. We were looking forward to visiting the underground museum where excavations of the old city walls (14-17th centuries) are preserved. It was a memorable experience and gave us a view of how people built and protected their towns. Other portions of the walls are visible in nearby buildings and plazas. After lunch we visited the Rodosto House which is now a museum honoring Frantisek Rakoczi II, a former High Sheriff of the Hungarian Empire who came to Koice leading an anti-Hapsburg revolt in the 19th century. He was a powerful and influential man in the area until he was captured and deported to Turkey. Following his death, his remains were relocated to Koice and entombed beneath St. Elizabeth’s Cathedral. We also found our way to the Zvonárska Street Synagogue. The outside of the building is beautiful, but once you step inside, you step back into a darker time. The synagogue is the oldest preserved synagogue in the city, originally completed in 1883 and expanded since then. Following the deportation of the Jews from Koice, the synagogue was used as a storehouse for the State Research Library and much of the beauty of the building was destroyed. Fortunately the stained glass windows and some of the altar remain. A photo exhibit by Yuri Dojc titled “Last Folio” detailed the plight of the Jewish people of Slovakia and, in particular, of Koice. During his research, Dojc entered one of the abandoned schools that had remained exactly as it was since the day in 1942 when thousands of children were deported to concentration camps. In a stack of dusty school books, he found one that had belonged to his grandfather. We completed our tour of the city with a cup of coffee at Robert’s favorite café. 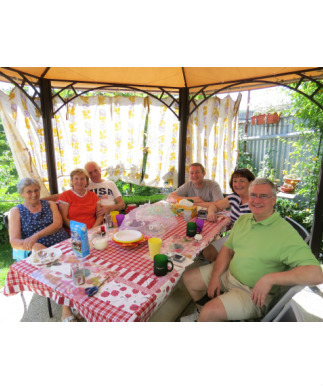 We returned home to another wonderful Slovak meal in the garden. Friday was truly a day of adventure. 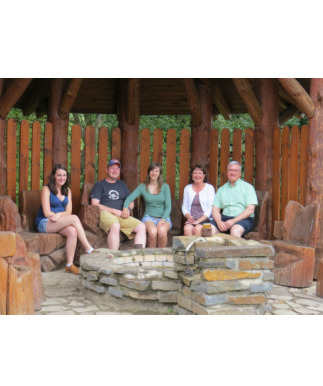 We left early with Lenka’s brother’s family to visit a cave an hour or so outside of Koice. We descended a long tunnel 100 or more feet to the mouth of the cave. This cave is unique in that it has calcite formations not seen in many caves. The 40 degree temperature was chilly, but a nice change from the 80 degree weather above. After the cave, we drove to Betliar where an historic Manor house is located. This home was built on the original 14th century foundation of a castle. Eventually the Andrassy family bought it and renovated it numerous times with the major renovation in the early 19th century. The hallmarks of this work remain today. The Andrassy family made their fortune in iron works but was also politically influential and an integral part of the Hapsburg Dynasty. Now a museum, the house includes a phenomenal amount of period furniture, paintings, etc. There is one room with a day bed where Napoleon actually slept! 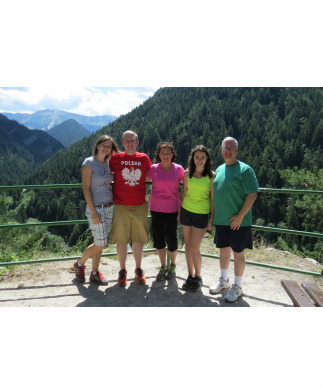 We look forward to enjoying the mountains and visiting some of Lenka’s family there. 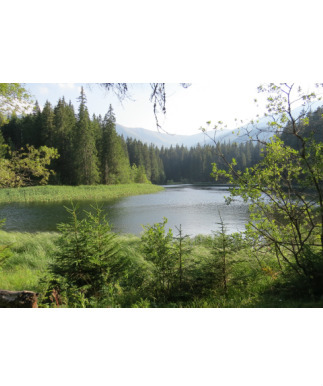 We plan an excursion to the High Tatras, a favorite hiking area and where Robert and Lenka were engaged. We also hope to visit another cave which has unique ice formations. We will think of you in the hot Rocky Mount weather while we bundle up in the cold caverns below. 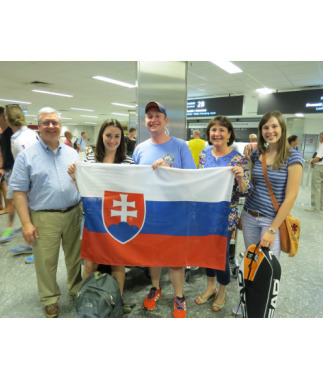 Twenty-three hours after leaving Rocky Mount and traveling through London and Dusseldorf, we arrived at the airport in Budapest and were greeted by Robert, Lenka, and Lenka’s cousin, Milos. 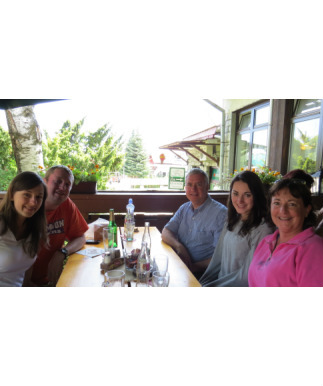 Another three hour drive through Hungary brought us to the Staron's residence in Kosice. We had a wonderful reunion with Lenka’s family and enjoyed a traditional Slovak welcome. Following a much-needed sleep, we enjoyed a morning in the Staron’s garden. Daniel, Lenka’s father, is quite the farmer, and his backyard is filled with tomatoes, beans, peas, potatoes, carrots, lettuce, cabbage, turnips, cucumbers, blackberries, strawberries, raspberries, gooseberries, grapes, and a peach tree. The Starons and Lenka’s grandmother are wonderful people. While we cannot always converse without a translator, we easily understand one another. Robert led us downtown where we met Lenka after work. 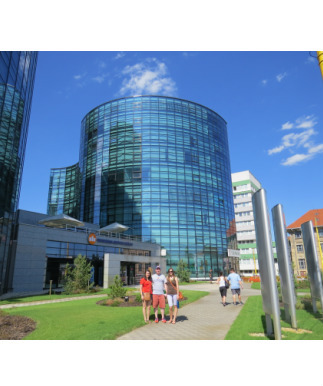 We visited Robert’s classroom in the circular Business Center of Kosice where he teaches conversational English and were able to hear him converse in Slovak with another teacher. He does quite well! St. Elizabeth’s Cathedral in the heart of the city was our first tourist destination. 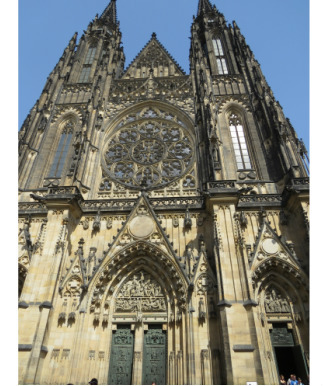 Begun in the fourteenth century and renovated many times, the cathedral has never truly been completed. In fact, part of the trancept is now sealed off for renovation. Nevertheless, it is a beautiful sanctuary replete with exquisite stained glass, wood and stone carvings, and a complex history. As I sat in one of the pews, I imagined all of the faithful souls who have prayed, worshiped, sung, and then returned to the world over the past seven centuries. 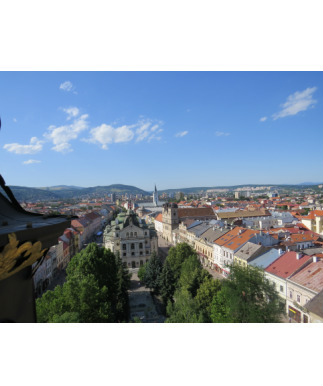 We concluded our visit with a climb up a winding stairway in the tower for spectacular views of the city. After strolling through the cobblestone streets of the old city, we returned to the house and were greeted by Lenka’s older brother Miro and his friend Daniella as well as Lenka’s other brother Dano, his wife Lucy, and their children Max and Kristy. A traditional Slovak meal in the garden capped off a wonderful day.